Sound is a fundamental aspect of almost any game. This section covers the basics of importing music, playing it back and some interesting tidbits that may not be obvious. 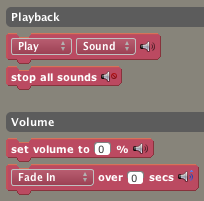 Import the clip into the Sound Editor by going to File > Create New > Sound. Click the following box to pick and import. Tip: Alternatively, you can just drag and drop the sound in. Looping "background" music takes just 1 block to do. Make a Scene Behavior out of this, or stick this directly into the "Events" for a scene. Exercise: There's a flaw in this approach. Think about what happens when you re-enter this scene... That isn't desirable, is it? Later in this article, we'll cover all the playback blocks available to you. Stencyl accepts MP3s and OGGs as follows. If your game unexpectedly does not export your game to Flash, it’s likely that sounds are the culprit. Ensure that your MP3's meet the following specifications. If you continue to experience issues with MP3s, post your issue to the forums and generate logs. For Flash games, licensing is handled by Adobe (the creator of Flash), and as a game developer, you do not have to worry about licensing for your Flash game, even if it makes money. For desktop and mobile games, we only work with OGG sounds, so the use of MP3's is irrelevant. Stencyl supports two kinds of sounds: music and sound effects. Music is streamed (like viewing a YouTube video) since it’s too large to fit into memory. This is best for background music. This incurs a small performance penalty on mobile devices. Sound Effects are loaded into memory to reduce latency in playback. This is better for short clips that need to be played immediately but consumes memory, particularly on mobile devices. All sound-related blocks are conveniently located under the Sound category. Volume ranges between 0% and 100%, inclusive. Note: If you’d like to pause and resume a sound, skip down to the Channels section. Looping music does not stop upon switching scenes. A common mistake, however, is to attach a “Background Music” behavior to every scene, causing the music to restart each time you enter a new “room” or "stack up." How would you solve this? One approach is to create a blank scene prior to the first level which loops the music. Since this scene is not encountered again, the loop behavior runs just once. Suppose that you’re playing Zelda. The regular tune plays, but when you approach an enemy, and the music switches over to the battle music. Once you defeat the enemy, the regular tune picks up where it left off. 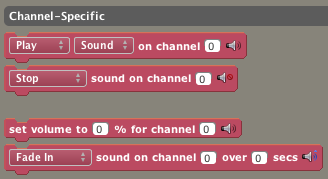 Channels are a simple way to refer back to a playback instance of sounds, so that you can control their volume and pause/resume them in the future. Channels are referred to by number, starting at index 0, ending at index 31. 32 channels are available in total. Note: When you play a sound/music without specifying a channel, Stencyl picks the next available channel starting from 0. If none are available, nothing happens. On the Android target, playing sounds may be delayed by a quarter to half second on some devices. This is due to a bug in Android's sound APIs. As of late 2015, this bug still exists and afflicts all products that use this API. Channels let you control playback. They have little to do with the regular meaning of sound channels. Don’t worry about MP3s - Adobe has you covered. On other platforms, we now use OGGs. How would you build this sound system? I think the link "He put up a shorter guide here." is broke. I am having trouble with pausing my background music. I want to be able to pause the music and resume it from where it last left off, which, I think, involve the use of channels. How do I use them? OneSaint, why don't you just create a single audio file with many different instances of the original cheer sound effect played over a couple audio beds? That way it only plays one sound, but it can still repeat the sound effect and overlap as many times as needed. I'm also stuck on sound bugs too.. ahhh... it makes me crazy LOL. Ridiculously, Another BGMs are overlapped with current BGM which is playing now, after other sound effects played. Of course, I set the BGM as 'music'. not a 'sound effect'. and... Is that sure Music can't be overlapped each other? I saw that two or more Musics cannot be played at the same time. Is there any problem on 'Channel is done' Event? or... Channel 0 is the problem? I've been stuck on this sound bug for a month now. I try triggering a cheering sound on a win bolean, and it plays it 60 times on start. I try playing it through channels and it only plays in the next scene. I've tried both turning the Sound into a "music" and "sound effect" track, with no luck. What am i doing wrong here. How do i get a simple cheering sound to trigger on an event? Compared to all other aspects of Stencyl as of this writing, I feel the sound blocks are lacking… like mentioned above in the 'Future' section… please add panning ASAP! Or add/make an extension for FMOD. Thanks for listening. Sound Pitching Features are urgently needed! I think it is not difficult to be added, technically. That function is required for game which uses Engine sound and Doppler effect. also are there any tutorials on how to make a platformer AI for a partner character? Kind of like Tails in Sonic 2? I've looked but I can't find one, although it could just be me missing it.